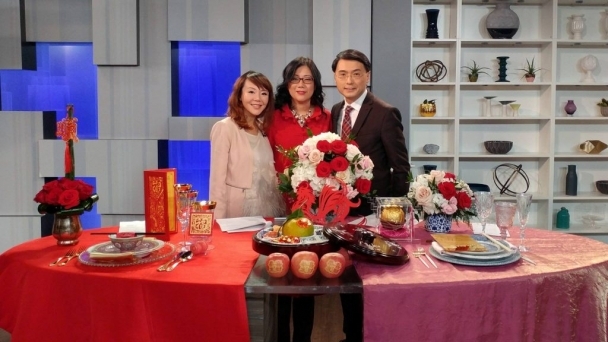 Last week, Carmen Luk from Devoted to You and I were invited to Focus Cantonese on Omni TV to speak about home decorating and styling tips for Chinese New Year. 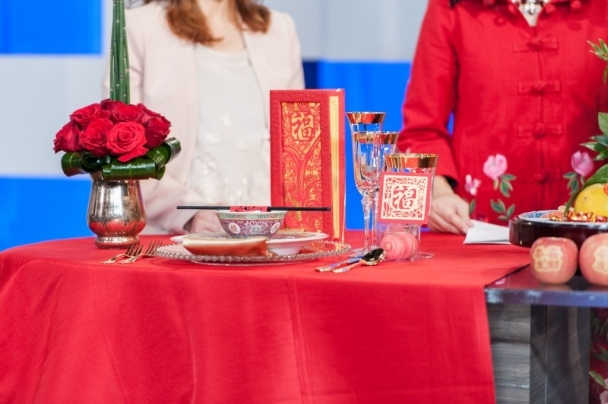 The segment was based on our recent collaborative style shoot featured on Toronto Star on Saturday, January 28th, which was actually Chinese New Year day. Both table top designs were inspired by vintage Chinese porcelain that my late grandmother owned and we used growing up. 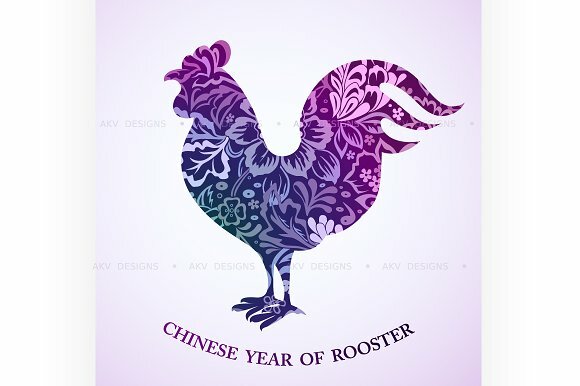 Chinese New Year is all about family, so being able to remember her in such a special way was very meaningful. The place setting on the left was a more traditional style, with the Mun Shou Longevity porcelain pattern that was once very popular with Chinese families. As this porcelain pattern is already in the red colour range, it was easy enough to pair it with more Western rental items like the gold beaded charger plate, gold rimmed stemware and gold flatware. The overall look was further enhanced by a bright red table linen. Many of these decorative items don’t necessarily have to be purchased; but available for rental purposes. On the right, we created a more modern colour palette inspired by the Ching Tung blue and white porcelain china pattern. The vases were accented by beautiful pink blooms. The blue and white porcelain pattern tableware is also quite common in Chinese households. The blue and white chinaware has very on point and trend right. This look can be reinterpreted for other celebrations such as bridal showers and baby showers. Many thanks to Nicole Richards for my glamorous look and helping me be camera ready!! Shout out to Secrets Floral Collection for providing the flowers on set. Tableware by Event Rental Group and Plate Occasions. Stay tuned for more photos of our photo shoot this week on our blog! For now, here’s the interview in Chinese. Yes, Carmen’s Cantonese is better than mine. However, as a “jook sing” (Canadian born Chinese) – my Cantonese is conversational. I also surprised all my family and friends; especially my dad who never misses seeing Kenneth. OMNI was the last place that they ever thought that I would appear! !